The Biewer Club of Canada is dedicated to the preservation, protection, and promotion of the beautiful German Biewer within North America. Our members consist of dog fanciers and dog lovers who are committed to keeping this beautiful breed true to it's German heritage and the original standard signed by Mr. Biewer. Our breeders do not believe in cross breeding their dogs with Yorkshire Terriers (also called the Yorkie), parti-colored Yorkshire terriers, or any other breed of dog. We recognize that the Biewer ancestry includes Yorkshire Terrier lines; however, it is through select Biewer to Biewer breeding that has established this wonderful toy dog as a breed of it's own. Our purpose is to continue the ongoing development of the Biewer breed for serious enthusiast, owners, and breeders of Canada and North America. Through appropriate health screening, optimal pedigree co-efficiency consideration, and continual focus on conformation, our club guides its members to meet the high expectations set forth in the breed standard. The Biewer Club Canada (BCC) encourages our members to become involved in conformation, canine obedience, freestyle, therapy programs, and many other canine activities available. We encourage participation by young members in events, such as Junior handling, acknowledging that they are the next generation of fanciers that will help preserve and protect the breed. As an organized club, we hope to educate Canadian breeders developing this wonderful, highly intelligent, inquisitive little dog as an accepted breed of its own. The Canadian Breed Club was established knowing breeders would need a platform as the Biewer continues to grow in popularity. Looking towards the future, we hope to guide others with the best breeding guidelines, promotion of the breed, educational opportunities, and registration practices. The Biewer Club Canada knows that with careful breeding practices, the future of the Biewer will be assured. The BCC breed order for breeding pairs includes DNA verification by a leading canine genetic company, insuring the development of bloodlines that will promote the health of the dog. Any major health issues discovered within in the breed will be followed to see if specific lines have been affected. Our club is dedicated to keeping detailed records of our dogs born in Canada and will address any issues that arise. We wish to continue developing a strong and loyal membership base. With this in mind, we welcome all admirers and owners whose interest cover any or all of the various aspects of this versatile, spirited, little breed. Biewers are elegant, happy, affectionate, and playful little dogs with the sweetest dispositions. They make excellent companions and due to their small size are the perfect pet for seniors, apartment dwellers, and those living in urban areas. They are a small toy dog breed with an average weight of between four to seven pounds. These beautiful, toy breed dogs are striking in appearance, with their lovely long silk coats and exquisite colouring. The head must have all three colours: black/blue, white, and gold in good symmetry. The belly, chest, legs, and tip of the tail are white and silky. The back colouring is blue/black with white and the tail is full, never cropped. Intelligent and confident, they can easily excel in obedience and agility training. They are very alert and make excellent little watchdogs as well as loving companions. The breed is non shedding, hypo-allergenic, great with children, and they get along well with other pets. Grooming consists of daily brushing, weekly baths, and occasional trimming of the ears and feet. "It has come to our attention that there is another registry that is going by the acronym of BBIR. This other registry is not affiliated in any way, shape, or form with the BCC's Registry of choice, the Biewer Breed International Registry! Please be careful not to confuse the two when it comes time for registering your Biewer. The original BBIR, will only register breeding of pure bred Biewers, the same as they have done since 2006. Please bookmark the following website www.bbir.org so it can take you to the original BBIR Registry." Finding reputable Biewer breeders in Canada can be challenging but worth the effort. A dog is an important long-term commitment, choosing the right breeder is an important step but not the first step. Your first step should be making sure they are the breed for you. Biewers are definitely the definition of cute but remember cute puppies grow up to be dogs with needs. Before making a decision on which puppy is right for you do your homework and make the decision with your head and leave your heart at home till your sure. Impulse buying all too often leads to disappointment. Pounds, shelters and rescue programs are full of dogs that were bought on impulse. Such a fate is not what a responsible breeder wants for the dogs he or she has helped bring into this world. Responsible breeders are knowledgeable about the breed and will strive to conform to the original breed standard. They do this in order to reduce inherited health problems and to keep faults to a minimum. Good breeders welcome questions and love to discuss the breed. They are willing to discuss the socialization process of their puppies, making recommendations for continued socialization and training. They should be willing to support you and your puppy through the life of the dog. The environment in which the puppies are kept should be open for your inspection and kept sanitary. Reputible breeders welcome your visit and should maintain an open-door policy. Biewer puppies that are raised in the breeder's home are better socialized and on their way to potty pad training. The dam of the litter should be on the premises and available for your inspection. Pictures and contact information of the owner of the sire should be made available to you. If the breeder you contact has no Biewer puppies available at the time, they should be able to recommend another reputable breeder. The responsible breeder has provided proper medical care and nutrition to all their dogs and should provide you with medical records, as well as proof of DNA testing, and Bile acid or Liver panel results. Their contract should provide a genetic disease guarantee. Reputible Biewer breeders will do DNA tests on all breeding pairs for the sake of their progeny. They will be willing and able to discuss whatever faults their dogs have (and all have them, no dog is perfect). All reputable Canadian Breeders will have a written contract and bill of sale, which you should read very carefully. They will offer a health guarantee of at least one year. Dogs should be free of any serious congenital or hereditary defects. The contract should stipulate if the breeder will pay any veterinarian costs or if puppies will be replaced if they are proven to have defects. Breeders work very hard to develop quality, well adjusted dogs, and are generally only breeding to produce something for themselves to show. However, not all Biewer puppies are show quality and you can locate some lovely, healthy pets through the right breeder. A reputible breeder puts their heart and soul into each puppy. They want to ensure that their puppies will go to forever loving homes. Usually, pups are sold with a very strict spay and neuter contract. Some show homes may co-own a Show/Breeding dog and then only after being titled will the co ownership be lifted. They want to make sure you are fully aware of everything it takes to raise a successful pet, good and bad. It is for this reason that responsible breeders will interview and ask you for references before deciding to place their puppy in your home. Much like a godparent, the breeder will contact you from time to time as the puppy is progressing to make sure everything is going well. Also like a godparent, they will look forward to you sending pictures and keeping them up to date on the puppy’s progress. The internet is a great resource as many breeders use websites to educate the public, telling you about the breed and their own dogs. Beware of sites where the sale of Biewer yorkies is the primary focus or where you can order a puppy through a feedback form. 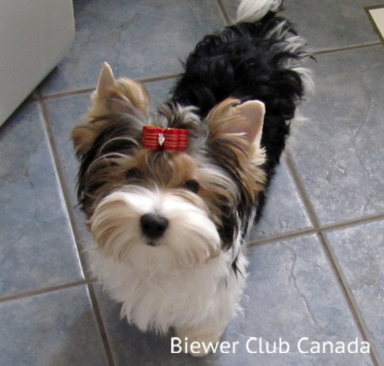 Breed Clubs like the Biewer Club Canada (BCC) and the Biewer Breed Club America (BBCA) can be found through search engines or through breeder sites. The Breed Clubs can give you information regarding the breed, what to expect from your Biewer, and links to breeders who adhere to a certain Code of Ethics. Internet chat forums like BFF are a great way to communicate with other Canadian owners of both pet and Show Biewers. These people have plenty of insight and are always willing to share information about this beautiful toy dog breed. Reputable breeders usually don't advertise in the local classified newspaper ads, glitzy magazines, or on a poster taped to a wall in the laundromat...places that the average person might look. Responsible breeders do not sell to pet stores. Most importantly, they will not sell in litter lots. While some will say this is because the breeders are being snobby, the real reason is quite simple. These venues encourage impulse buying and mass reproduction( puppy mills and brokers). Take some time to visit a specialty dog show. See these small dogs in action and talk to breeders who spend their time showing their dogs. Talk to the handlers, not all owners show their own dogs, some use handlers. Most dog people would love to bend your ear telling you about their dogs, but the show environment sometimes limits the breeder’s ability to spend the time they need to get to know you. Shows can be hectic and nerve-wracking for exhibitors; it probably wouldn't be the best time to waylay someone on their way into a ring. Take their contact information and contact them privately. If you find it impossible to find the perfect Biewer yorkie, you may need to consider shipping a dog in from another part of the country or from another country. Videotapes, email, and shipping by airplane might make it possible for you to have the pup you want. Purchasing long distance from a responsible breeder can be a rewarding experience or it may be more than you bargained for. Other countries have different laws and standards regarding vaccines, shipping, etc. You must be exceptionally vigilant about checking out breeders you are considering that cannot be easily visited. Contact former buyers for references to see what difficulties they experienced, if any.